Rick Roberts has lived in Greenville since 1974, is a graduate of Mauldin High School and Clemson University where he received a bachelor's degree in business management with a minor in marketing and communications. Rick and his wife Kim along with their two beautiful daughters, Kyley (15) and Reese (10), are active members of the Greenville community and attend Grace Church. Rick has served on the board of multiple Home Owners Associations and has dedicated time and resources to multiple charities. He has always had a special passion for the Meyers Center Special education school and has worked on fundraising and served on their board. 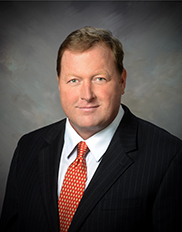 Roberts has served in various professional roles including the VP of Operations at Roberts Communication Construction Inc., where he helped exponentially grow the company. "I learned the importance of managing every dollar, which allowed us to be profitable during both good and bad economies." He is currently the President of KMC Benefits Inc., a benefits and brokerage firm that focuses on helping large employers reduce costs and develop plans to improve the health and satisfaction of employees. Rick is newly elected and looking forward to being a positive influence for District 21 and Greenville County. Rick currently serves on the Planning and Development Committee and is Chairman of the Public Safety and Human Services Committee.